The clinical utility of a wide range of drugs, especially within oncology, is strongly curbed by dose limiting toxicities. Dosed systemically, the entire body is treated and typically, less than 0.01% of the injected dose reaches the targeted pathology (e.g. tumour). As a rule, these therapeutic regimes are not terminated because the patient is cured, but because of excessive systemic toxicity. Figure 1. Medical need – Why targeted drug delivery? Over the last few decades, the pharmaceutical industry has spent vast resources in trying to overcome this dilemma with various approaches for targeted drug delivery. By enhancing delivery of drug specifically to the pathology in question the systemic exposure can be reduced (reducing toxicity), and the efficacy is increased (cf. Figure 1). What is Acoustic Cluster Therapy (ACT®)? Figure 2. Basics of the ACT® Formulation (left panel). Negatively charged, regular US contrast microbubbles (Sonazoid™, GE Healthcare) are mixed with positively charged microdroplets of an inert, perflourated oil. Upon mixing the two entities form minute, free-flowing μ-bubble/μ-droplet clusters and it`s these clusters that serves ACT® with its unique biomechanical attributes. Basics of the ACT® Procedure (right panel). The medicinal regime (e.g. infusion of chemo therapeutics) is performed in a regular manner and a small injection of ACT® is given i.v. The μ-bubble/μ-droplet clusters are dispersed in the vascular compartment and active targeting is achieved through local insonation of the pathology in question. The conceptual idea behind the ACT® approach is localized enhancement of extravasation, distribution and uptake of drugs (e.g. chemotherapeutic), systemically co-administered together with the ACT® formulation. It is a platform technology capable of enhancing significantly the clinical utility of a wide range of therapeutic molecules and nano-drugs for a wide range of clinical indications. The ACT® product is formed by reconstitution of commercially available, negatively charged microbubbles (Sonazoid™) with an emulsion of positively charged microdroplets of an inert, perfluorated oil. The active moiety comprises free flowing, microbubble/microdroplet clusters formed from the electrostatic attraction, engineered to phase shift (vaporize) in-vivo in a controlled manner (cf. Figure 2). Figure 3. ACT® mechanisms. Upon insonation of μ-bubble/μ-droplet clusters held within the micro-vascular compartment, the oil component instantly evaporates and create a large (~ 20 μm) bubble that transiently deposits at micro capillary level. Further insonation induce controlled volume oscillations and a range of biomechanical effects that increases the permeability of the vascular barrier and enhances extravasation, distribution and uptake of drug in the targeted, extra vascular tissue. The clinical procedure is simple. In addition to a small i.v. injection of ACT®, the drug is administered in a regular manner (e.g. infusion of chemotherapeutic agent). When the μ-bubble/μ-droplet clusters are exposed to standard medical imaging US at the targeted pathology, the microbubbles transfer acoustic energy to the attached droplets, which undergo a liquid-to-gas phase shift (cf. Figure 3). The resulting vapour bubble instantly expand to ~ 20 μm and transiently (~ 5 minutes) deposit in the targeted capillary network. Further application of US oscillates these large bubbles and induces well-established, non-thermal mechanisms including stable oscillation, localized microstreaming, and radiation and shear forces that increase the local permeability of the vasculature, increasing transport of the co-administered drug across the capillary barrier and through the extracellular matrix. It should be noted that all constituents in the ACT® formulation are chemically and biologically inert; there`s no active biochemistry and no metabolism involved - the approach rests fully on physical and biomechanical effects. For further details on basic concept, formulation and attributes, see , , and . In a series of pre-clinical studies, ACT® has been shown to strongly increase the therapeutic efficacy of a wide range of drug molecules (e.g. Abraxane®, paclitaxel, Doxil™ and gemcitabine) for a range of oncology indications (pancreatic, prostate and breast cancers) , , , and . Kaplan-Meier plots from two of these studies are shown in Figure 4. Figure 4. ACT® pre-clinical Proof of Concept. Left: Survival plot from study investigating the effect of ACT® in combination with Abraxane® for treatment of human prostate cancer in mice . Right: Survival plot from study investigation the effect of ACT® in combination with Doxil™ for treatment of triple negative human breast cancer . Figure 5. ACT® pre-clinical Proof of Principle. Optical imaging of tumour specific uptake of macromolecular fluorescent marker (CW800PEG) co-administered with ACT® . Left: CW800PEG only (control). Right: CW800PEG + ACT®. 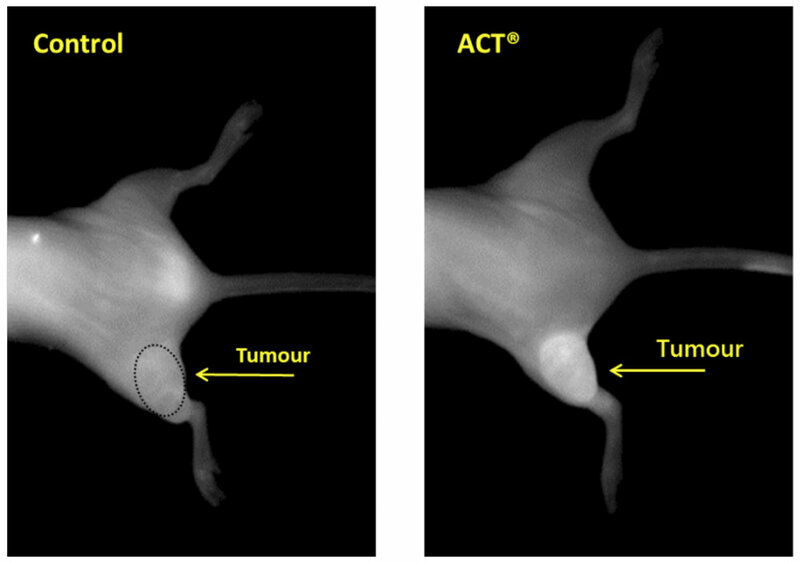 ACT® has also been show to increase tumour specific uptake of co-administered model molecules as much as 2-300%  (cf. Figure 5). Figure 6. ACT® pre-clinical Proof of Principle. Optical imaging of a rat brain, showing localised uptake of macromolecular fluorescent marker (CW800PEG) co-administered with ACT® . Whereas Phoenix so far has focused on the oncology segment, ACT® has also been explored for potential medicinal treatment of CNS disorders (e.g. cancers and TBI). The vasculature of the brain is extremely tight (the “Blood-Brain Barrier) and effectively precludes medicinal treatment with molecules larger than approx. 500 Da, disbarring most modern therapeutics. Hence, employing ACT® to induce a controlled, transient opening of the BBB, this would open for an entirely new approach for medicinal treatment of CNS disorders. In two studies, ACT® has been shown to allow for controlled opening of the BBB and delivery of both small and macromolecules to brain tissue  (cf. Figure 6). ACT® is well tolerated; in the studies referred above, no treatment related weight changes and no distress or Adverse Events were observed during or immediately after treatment. ACT® has also been explored in a series of dedicated safety studies with no clinically relevant observations .